This is the largest property at Beau View which is an exclusive gated complex of just 11 apartments and townhouses situated just a few minutes walk from Peyia Village square and all its amenities. Beau View is an exclusive gated complex of just 11 apartments and townhouses built in a contemporary style and (genuinely) just a few minutes walk from Peyia Village square and all its amenities. Both the townhouse and the complex offer stunning uninterrupted views over Peyia, Coral Bay, Paphos and the Mediterranean Sea. Take a swim in the large infinity pool or Jacuzzi/spa whilst you enjoy the views or relax on the sun loungers and feel the gentle breeze as you absorb the warm Cyprus sunshine. Watch the sunsets from the properties balcony or sun terrace then take a gentle stroll down to Peyia Village for lunch or dinner in one of the many great traditional tavernas where you will find the best hospitality anywhere in Paphos. The beach resort and amenities at Coral Bay are just a few km away by the coast and you have an excellent base for exploring the villages such as Kathikas with its wineries and many great restaurants or across to the Akamas Nature reserve which hosts one of the best unspoilt beaches in Cyprus (Lara). 'The Halcyon Suite' at Beau View in Peyia, Paphos is accessed from a private road just 200m from Peyia Village square. Access to the property is at first floor level from the ‘plush’ common landing area with elevator. Entry from the main apartment door is into the stunning modern lounge/dining/kitchen area. Immediately to the right hand side is the contemporary and fully equipped kitchen which hosts all major bosch appliances such as fridge/freezer, integrated dishwasher, hob & hood, waist height oven and microwave. Within the same open plan areas is the lounge which is equipped with a large leather corner sofa in a contemporary style and can easily seat 6. The sofa is centred around the large wall mounted flat screen TV with DVD and Satellite connection which is provided for your entertainment. An elegant dining table which can seat 6 is conveniently positioned between the kitchen and lounge. Access from the lounge can be gained to the very private 40m long balcony which offers a choice of areas for relaxing on the sun loungers, sitting on the sofa set admiring the views or alfresco dining using the outdoor table and chairs that seats 6 and perhaps even the large stainless steel BBQ. With stunning uninterrupted views, the balcony is the perfect place for relaxing in the sun and socialising with your group. Back into the inside areas and you will pass a useful wc/cloakroom which also hosts the washing machine before accessing 2 of the bedrooms. The master bedroom at the end of the corridor hosts a king-sized bed, fitted wardrobes and an en-suite bathroom with bath and shower. access can be gained to the balcony though sliding patio doors and a rattan style sofa is situated in the covered area just outside. The second bedroom also hosts a king-sized bed and fitted wardrobes. The en-suite is spacious and has a large walk-in shower which could be great for anyone with mobility issues. The bedroom also gives access to the balcony Again this hosts a king-sized bed, fitted wardrobes and allows access to the balcony. The En-Suite hosts a bath and shower. The apartment is fully air-conditioned (modern system & included in rental price) with other extras such as hairdryer, coolbox, coffee maker and pool towels provided. Wi-Fi is included in the rental rate. Please note that due to a complex policy, we cannot accept children under the age of 12. The current IPTV system features most UK Sky channels (premium sports, documentaries, movies & music included). It also features a library of 900 movies, series and children's series which is regularly updated. The grounds of Beau View are accessed through a set of gates that lead into the complex and pool area. 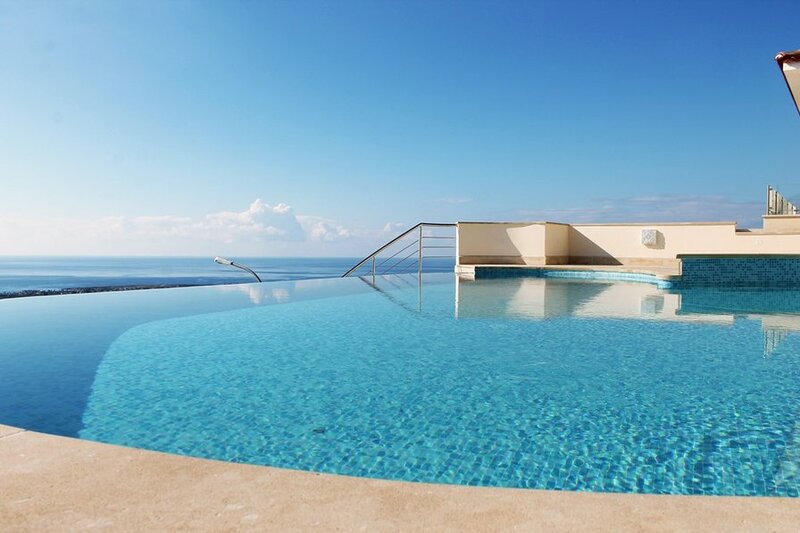 The focal point of the external areas is the stunning infinity pool with spa, the surrounding sun loungers and parasols and amazing views towards the Sea. The pillars and stone facings give a true luxury feel in this small and intimate collection of exclusive properties. The village of Peyia is one of the most picturesque and popular villages in the area. It is spread over a large area with the village centre (only 200m/2-5 minute walk) having many good amenities including Bars (with Wi-Fi) Restaurants, Takeaways, Shops (Supermarket, Bakery, pharmacy, fishmonger, deli) and a bank (to name but a few). Only a 5 minute drive away is the famous Coral Bay resort with its Sandy beach for all the family as well as its more extensive selection of nightlife and daytime activities. Other things to do in the area include Paphos Bird Park, reptile park, horse riding, Akamas Peninsular & Lara Beach Nature Reserve (famous for turtles), hiking/walking, buggy safaris, 4 x 4 safaris, sea caves area, watersports, sailing, wineries and much much more. Amusements and the Waterpark in Paphos are also easily accessible from Peyia, as are numerous archaeological ruins such as the Tombs of the Kings, Paphos Mosaics and the Christian Catacombs. Please note that this property can be accessed at any time after 3pm on arrival day so dont worry if you have a late flight. There is a keysafe which we provide a code for. We can arrange taxi transfer by our own driver who knows where the property is and assist with car hire from the airport if desired. The property is professionally managed (you will always have a contact) and has linen changes and cleaning on a weekly basis (10-28 night stays). Air-Conditioning is included in the rental price as is a welcome pack of basic essentials for your arrival. Please note that for safety reasons we cannot accept children under the age of 12. Quality appliances in kitchen. 6 x Private Sunloungers on Balcony, Table & Chairs to seat 6 for dining, sofa set and 2 Parasols. Pool/Beach Towels. Satellite TV. Hairdryer. Wi-Fi included without charge.